Mexican Color Bowl garden pottery made of real terracotta clay for home and garden use. What makes this terra cotta garden bowl so different is the fact that it has no feet or a pedestal base to sit on. It's wide and shallow with a small flat base you don't see. This gives the feeling that this planter bowl is floating above the surface it sits on. The sides of the planter are smooth and silky with a light sun baked color. Both sizes of these real clay garden containers are large enough for a colorful floral display or succulents & cacti. Use indoors or outdoors and enjoy the beauty. 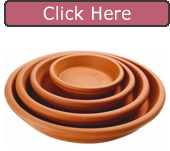 Our planters are made of real terracotta clay so you know you are giving your plants a healthy start.